Assistants: Moses Ball, Janet Gould, Roosevelt Nunn Jr., Damon Reed, Catina Robinson, and Apache Wakefield. Community Participants: Bethel New Life - Beth Anne Campus residents, local neighborhood residents, and local youths. In 1989, Bethel New Life, Inc. purchased the shuttered St. Anne’s Hospital grounds on the West Side of Chicago. Over the next decade, the faith-based community and housing development corporation revitalized the nine-acre facility into what’s now called the Beth-Anne Life Center, to provide senior residencies and intergenerational programs. “We saw the need to help support elders so that they could stay in the neighborhood when they needed more care than they could give themselves,” says Mary Nelson, president and CEO of the West Garfield Park/Austin-based Bethel New Life. The landscaped campus, centered at 1140 N. Lamon Avenue, features eight newly constructed and rehabbed buildings, and operates very much like a community unto itself. It’s home to senior housing complexes, an adult day services facility, a day care center, a small business center, a cultural and performing arts center, Bethel’s administrative offices, and an office building that houses a bank, medical services, and a Head Start program. However, Bethel realized that the campus was a “formidable piece of architecture,” unconnected to the larger neighborhood, according to Nelson. To help allay this, art projects gradually extended out from inside the center to visually engage the surrounding residential area. Bethel realized the potential of public art to beautify its environment, to celebrate diverse cultures, and to involve community youths. In 1996, with facilities still under reconstruction, the Chicago Public Art Group began partnering with Bethel and Gallery 37, the City of Chicago’s job training in the arts program, to enhance the Beth-Anne Life Center with a series of artworks. The works--which evoke family, intergenerational, African American, and spiritual themes--have been sited throughout the grounds. While the Beth-Anne Life Center has generated $30 million worth of investment in the neighborhood, it has also grown to become one of Chicago’s most preeminent showcases of community public art.The first elders began moving into the campus in 2003. Still, states Nelson, “We were concerned that the isolation between Beth-Anne residents and the surrounding community would continue.” To address this concern, Bethel New Life and the CPAG decided to take their partnership to a new, more complex and challenging level, one that involves space planning as well as the execution of artworks. In coming years, the CPAG and Bethel New Life plan to cultivate vacant lots around the campus with art gardens. The two organizations will also facilitate workshops where area residents can create yard pieces to take home. There are many possibilities. The goal is to use public art to create a “dynamic interchange” among artists, Beth-Anne residents, people in surrounding neighborhoods and in the city--to make bridges from the community center to communities, from one generation to another. C. Siddha Sila’s mural New Life, New Love (1996), on the day care center, celebrates family unity with images of children and elders sharing mutually loving and learning relationships. On a vivid purple backdrop, the work’s spiritual theme is enhanced by golden angelic figures and religious texts. For additional images, see portfolio in Murals section. Peace by Piece (1998), by John Weber and Nina Cain, is a courtyard installation in which neighborhood youths celebrated the strengths and rituals of African American life through interpreting family photographs in ceramic mosaic. Discussions with youths about how their families came north yielded images of the Big Dipper which guided runaway slaves and a train engine representing the Great Migration. A set table and a frieze of collard greens recall shared family traditions. For additional images, see portfolio in Mosaics section. 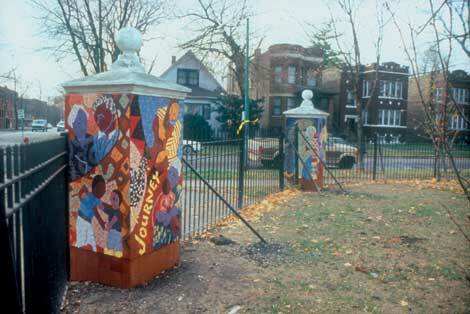 Cain and Weber returned the next summer to create Remembered Gates New Song (1999), ceramic mosaics for the center’s historic entry posts at the corner of Lamon Avenue. and Thomas Street, and two wall pieces--Reading Together and Garden of Time. For additional images, see portfolio in Mosaics section. The African Village Courtyard Mural (2000) involved the transformation of a courtyard into an outdoor learning center with an African Village theme. The finished project included eight images that were chosen for their common themes of unity present in any society. For example, the panel depicting ladybugs and sunflowers contrast with other panels where humans are the predominant subject matter. It is intended to illustrate the union of humans and nature. Through such images, a viewer can begin to imagine the day-to-day encounters and happenings within an African village. The Griot’s Throne (2002), is a functional sculpture created under the leadership of Nina Smoot-Cain and Phil Schuster. In many West African cultures, the griot is the storyteller and keeper of history. The role of the griot is extremely important to the survival of the group. Without a written language, the griot functioned as the memory bank for all elements of everyday life and living. Animals were often incorporated into behavioral tales of great wit and prowess by the griot to make the stories more memorable. The Griot’s Throne provides images of both humans and animals to inspire memories of the ways in which these tales of animals still teach us how to live today. The throne sits at the southeast side of the Senior Residence Center at the Beth Ann Campus, adjacent to the playground of the Molade Day Care Center, encouraging the seniors to tell their life and cultural stories to the children of Molade. For additional images, see portfolio in Sculpture section. A bricolage mosaic project, Journey Together (2003), involved students from Austin High School along with senior citizens from Bethel New Life’s Senior Program. Artists and participants worked together on the design and creation of the mosaic mural. The colorful mosaic revolves around a central bird image backed by two hands and an onlooker on either side. It embellishes a patio used by the residents of the Beth-Anne Center. For additional images, see portfolio in Mosaics section.